Deborah Boardman, "Book of Faults," 2010, unique painted book, 23 1/2" x 34"
During her nearly four decades of artistic practice, Chicago artist Deborah Boardman dubbed herself as a “painter and …” — a moniker that aptly describes her practice of multidisciplinary projects, informed by a painter’s approach and sensibility. An array of paintings, works on paper, artist books, animations and performance documentation are accompanied by a timeline of the collaborative projects she pursued outside of the studio, from murals and books created with South Side Chicago congregations to portraits of chemo patients in India. In “Painter, &” curated by Jessica Cochran, Boardman’s exceptional body of work abounds with spirituality, symbolism and vulnerability. Boardman’s early works feature figures rendered in chalk, pastel and paint that are emotive and gestural in style, and Biblical in visual language. In works like “Icon” (1988) and “Commemoration Box (from Memento Mori)” (1992-1993), shaped, wood framed canvases are peaked like steeples. An egg tempera painting, “Moses” (1996), features the swaddled infant floating above the river, flanked by reeds — a tradition rendering of the story. By the late 1990s and beyond, however, the inventiveness of Boardman’s iconography widens, and Buddhist influence appears with the inclusion of eight-spoked Wheels of Dharma and lotus forms, as well as an array of transcendental content, like dreams, divination and dowsing. The spiritual is not dogmatic, it’s the means through which the artist explores place: physical and metaphysical, concrete and abstract, and whatever she sees in between. During the 2000s Boardman undertook a series of all-over plaid paintings, a surprising turn for an artist with such a commitment to content and representation. But, together with the studio and domestic interiors she painted concurrently, their meaning goes beyond strict formalism. Images of these plaid paintings appear within the interior scenes of other untitled paintings from 2005 and 2009, turning them into symbols of a painter’s creativity, of a life’s work. Far from veering into formalism, Boardman gets truly personal, and maintained that trajectory for the rest of her life. 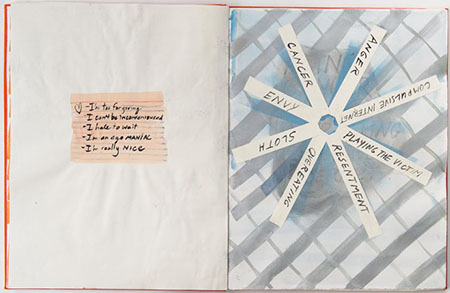 In “Remedies,” a unique painted book from 2009, images of interiors are accompanied by pages of plaids, a painted pile of pill bottles, and a list of their contents on the succeeding page. The topic of Boardman’s personal wellness is not surprisingly the most powerful aspect of “Painter, &,” as the artist integrated her diagnosis of breast cancer (the illness to which she ultimately succumbed in 2015) into her investigations of physicality and the supernatural; and now, life and death. In a major project presented in 2012 at the Chicago alternative space, 6018NORTH, the artist hired professional dowsers to locate fault lines and underground waterways beneath a historic mansion, marking these places on the floors as a visual inquiry into the theory that these kinds of natural phenomena are linked to the presence of ghosts in specific locations. The public aspect to Boardman’s practice documented here includes “A Porous Space II,” in which the artist formed a choral group, the La La La Singers, to perform a song composed of personal faults contributed by the community at the College of DuPage in Addison, Illinois (which also were manifested in an artist book produced for the same project). However, this exhibition speaks best to the more intimate nature of Boardman’s work. Installed on a wall adjacent to a table full of her artist books is a shelf of dated and decorated journals that the artist kept throughout her life. Unlike the artist books that are accompanied by pairs of white gloves to flip through, viewers can’t touch these journals or leaf through the details of her daily life. Still, the very presence of these worn piles of journals underscores the poignancy of this posthumous survey. It is permeated with the sensation that the artist is both here and not here, that we know her and we don’t know her, in line with the mystery of in between states of existence that she explored throughout her entire career.